Jürgen Klopp admitted Liverpool were far from their best in the 2-1 defeat to AS Roma in St. Louis on Monday night – but the Reds boss understands why his team were below par. Goals either side of half-time from Edin Dzeko and Mohamed Salah, which sandwiched Sheyi Ojo’s headed equaliser, meant the Reds ended their tour of the USA with a loss. Klopp told his post-match press conference that the scoreline could have been “6-5 to either side at half-time”, such was the openness of the game at Busch Stadium. The manager also gave an update on the fitness of Alberto Moreno, who picked up a knock late on, as well as offering his views on the trip to America before the Reds fly back to the UK. Read on to find out what the boss had to say. It was obviously not our best game but games like this can happen. We weren’t compact in the first half and had too big spaces between the positions, so nearly every offensive action of Roma was a chance. It makes no sense. On the other hand, we had a lot of good chances too so it could have been 6-5 to either side at half-time. That may be exciting but is of course not what I want. Sometimes as a manager you have to accept things and tonight I can accept it because I know why. 13 days in the USA and the hardest circumstances tonight at the end, after a lot of intensive sessions and then this wet heat. It was not too easy. We had a lot of games in the last few weeks and the opponent had no games in the last two weeks. We knew all that before the game, so it’s hard. But of course we have to do better in games like this. Tonight it was easy to see what’s wrong; that’s good because it’s easier to change it. 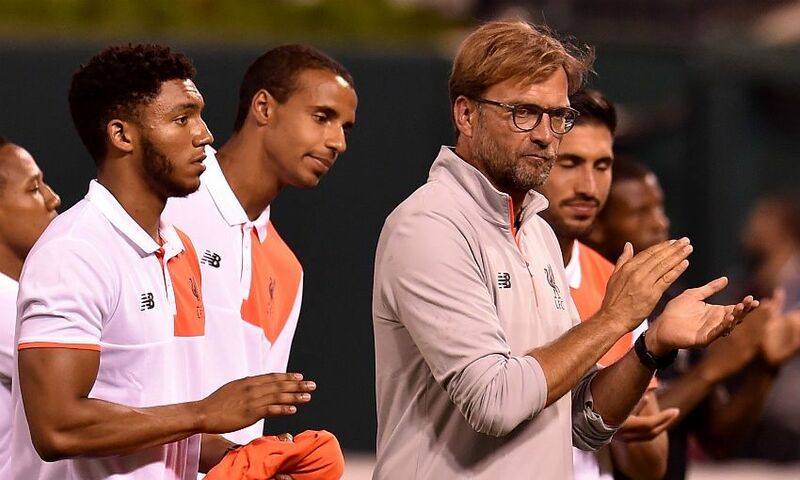 We did really well in this pre-season camp – we had a lot of perfect sessions and really good moments in our games. Tonight there were a few offensive situations we played really well and were unlucky or a good goalkeeper or whatever. We didn’t score often enough but I’m happy nobody is injured after this game. It was really difficult for my team to play tonight after this intense time. Now we have finished, hopefully a safe trip, go home to England and build on the base we made here. Yes, [he is OK] – dead leg in the hamstring. He couldn’t activate the muscle so you cannot play. That’s how it is. I don’t have enough time [to watch], I am pretty busy in England! When I watch football as a fan from other countries it is mostly Germany, otherwise I am watching players for scouting. When the player is in Italy, then I will watch Italian [football] and I have seen a lot of good players there. I am absolutely the wrong person to imagine how the Italian league could end next year. I think Juve will play a good role. Roma are an experienced team with a very experienced manager, but I have no idea [how the season will finish].